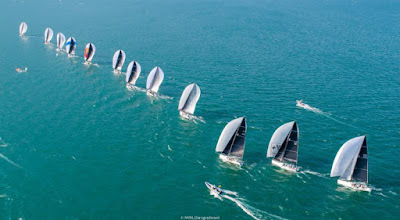 Riva del Garda, Italy (July 28, 2018) - After three days and a fully completed eight race series in Riva del Garda for the 2018 Melges 32 World League circuit, Matteo Balestrero and his GIOGI team which includes tactician Branko Brcin, and crew members Giulio Desiderato, Federico Michetti, Elio Borio, Christiano Giannetti, Simone Spangaro and Leone Taddei are 2018 Melges 32 World League Riva del Garda Champions! Balestrero made winning look easy as he took lead of the event on Thursday, and then successfully defended his position until the end. "We gritted our teeth and raced with great confidence, working hard to manage the conditions as best we knew how," said Balestrero post racing. "Our opponents did not give a millimeter, so we had no choice but to work hard to attain this goal. This victory is quite significant, but we are already focused on the two most important events that are yet to come: Cagliari and of course, the World Championship in October." Victory is of the sweetest type for Balestrero, because with this win he is now tied in equal points with Riva del Garda' s fifth runner-up Vincenzo Onorato (Paul Goodison, tactician) and his MASCALZONE LATINO team for the lead position on the World League ranking. "Today's two bullets were wonderful. Paul made some great calls, the crew work was great.' said Onorato. "It's a pity to have lost so many points during the first two days of racing. We just had some bad starts... and, good starts are critical on Lake Garda. But today, we reminded everyone that MASCALZONE LATINO is still very much here. Congratulations to Matteo and the GIOGI team for their victory - see you in Cagliari." The final day of racing, once again did not deny spectators and teams alike many moments of suspense and racing excitement. Balestrero and reigning World Champion Pavel Kuznetsov at the helm of TAVATUY (Evgeny Neugodnikov, tactician) were tied with equal points going into Race Eight, Edoardo Lupi and Massimo Pessina's TORPYONE (Lorenzo Bressani, tactician) were ahead by one. Shortly after the start, Kuznetsov was forced left, while Balestrero focused on and battled with Lupi/Pessina for best position. The two fought aggressively right up to the finish line in which at first, it appeared that Lupi/Pessina had the advantage. As Onorato zoomed across the finish line capturing his second bullet of the day, followed by the Pavesio brothers on FRA MARTINA in second, Christian Schwoerer on LA PERICOLOSA in third, and Waldamar Salata on CASINO ROYALE in fourth, Balestrero overtook to take fifth making it a photo finish with Lupi/Pessina getting sixth. All things remained competitive in the Corinthian Division with Martin Rientjes's CAPIRINHA taking top honors, finishing ninth overall. Kilian Holzapfel on HOMANIT took second, followed by Alessandro Lotto Flavio Campana on DUMBOVIT in third. Next up on the event agenda is Cagliari for Event No. 4 on August 30 thru September 1, then onto the World Championship happening October 17-20. 1.) (ITA) Matteo Balestrero/Branko Brcin, GIOGI = 54 pts. 2.) (ITA) Vincenzo Onorato/ Paul Goodison, MASCALZONE LATINO = 54 pts. 3.) (MON) Giangiacomo Serena di Lapigio/Michele Ivaldi, G.SPOT = 51 pts. 4.) (GER) Christian Schwoerer/Nick Asher; LA PERICOLOSA = 49 pts. 5.) (RUS) Pavel Kuznetsov/Evgeny Neugodnikov, TAVATUY = 44 pts.